* This post contains affiliate links which if you use for any purchase, may yield me a small commission, at no extra cost to you. Thank you. Namaste friends, Happy Republic Day. Today India celebrates its 70th Republic Day and it is a proud day for every Indian. As per the tradition started by my Dad, I watched the Republic Day parade on TV. I love watching the parade, the spirited marching, the tableaus and the dances performed by school children. Don't patriotic celebrations and the National Anthem leave you teary-eyed? No? Only me?... Okay, never mind. On a side note, I don't understand all this controversy about (not) standing up for the National Anthem when it is played at the beginning of movies, at the theatres. Young men are giving up their lives at our borders so that you can relax, live a normal life and watch a movie whenever you want to. And you cannot stand up for 52 seconds while the National Anthem is playing! Disgusting!! Now, on to the crochet front, I am going to share my most favourite project till date - the Stardust Melodies Blanket. 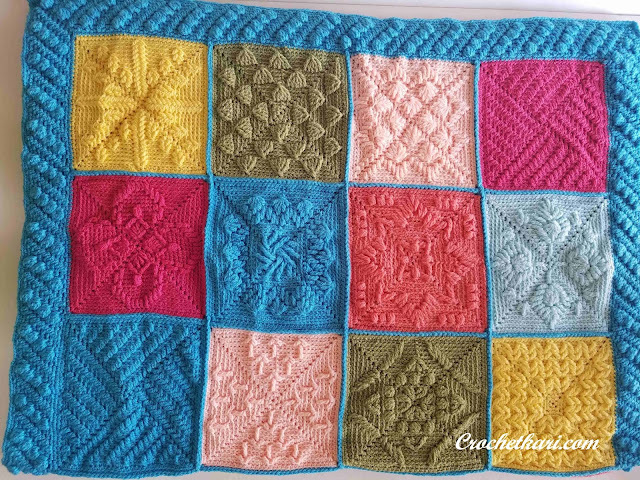 This pattern was a CAL on Every Trick on the Hook by the super talented Polly Plum. It consists of 24 squares and 2 different types of borders. The CAL ran for 13 weeks with two patterns being released per week. Now for the best part! 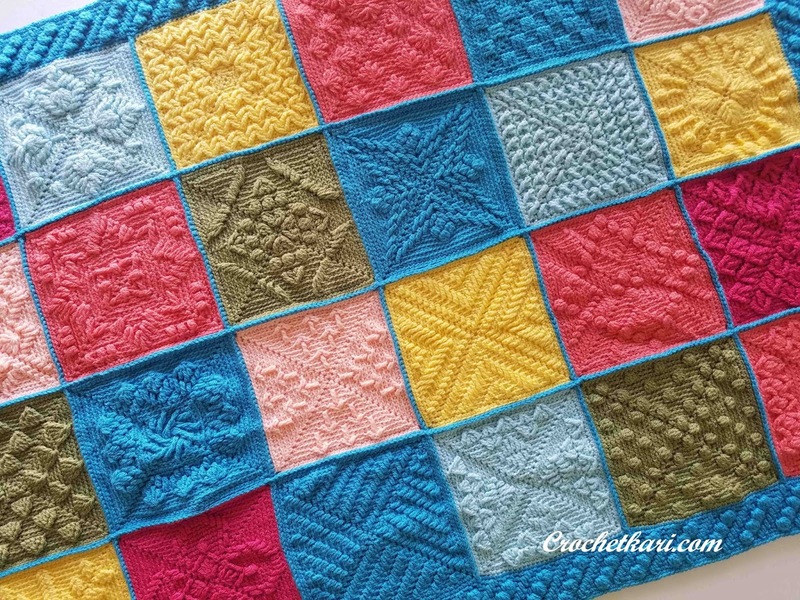 Twelve of the squares were free (still free on the blog) and twelve were paid patterns on Ravelry. I decided to make only the free ones and repeat them to make my blanket. As you can see it was totally worth it! I had purchased the yarn from Deramores over the years, in small lots. Mainly because the cost of yarn along with shipping fees made it a bit expensive. And I was going to use it only for a very special project. I used a 4.50 mm hook* for the blanket, which was the recommended hook. It has given a lovely drape to the blanket. 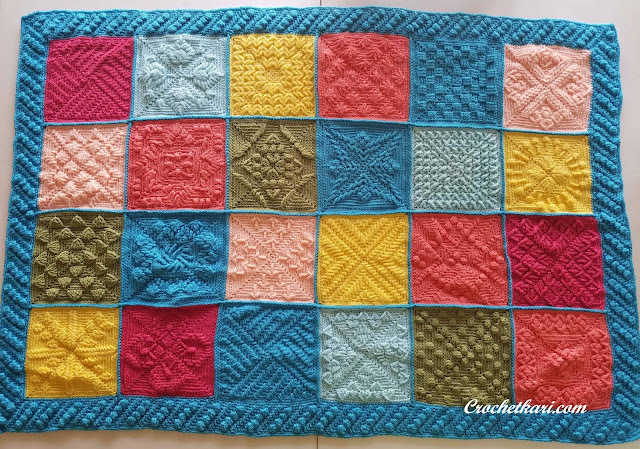 I was going to block the blanket before posting it, but as "done is better than perfect", I decided to proceed with the blog post and not succumb to procrastination. 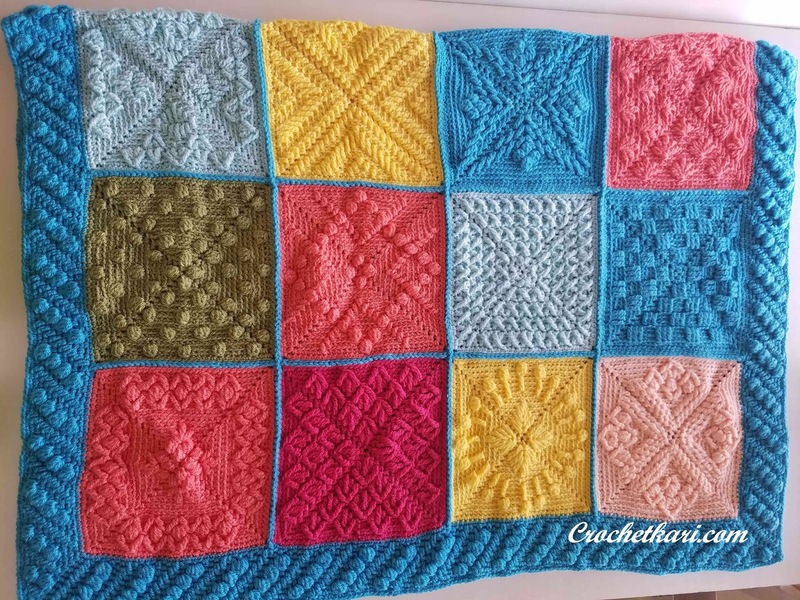 Each square was a delight and while some squares were a bit difficult, the ebook has charts for all squares. Polly has even added how-to videos on Youtube. I joined the squares by holding them wrong sides together and sc into the back loops only. 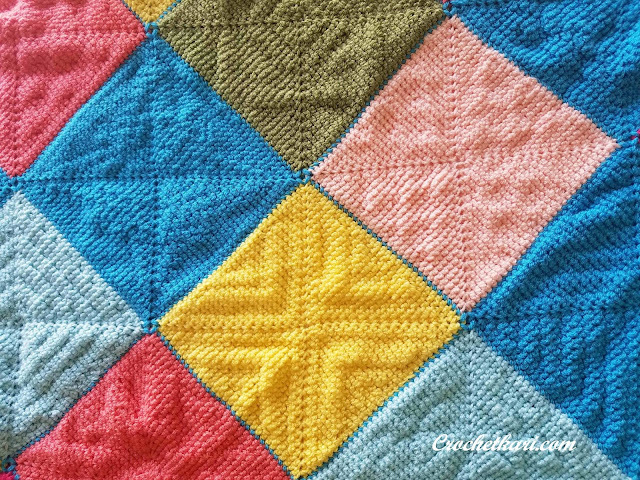 Since the squares were textured, I liked the ridge between the squares. 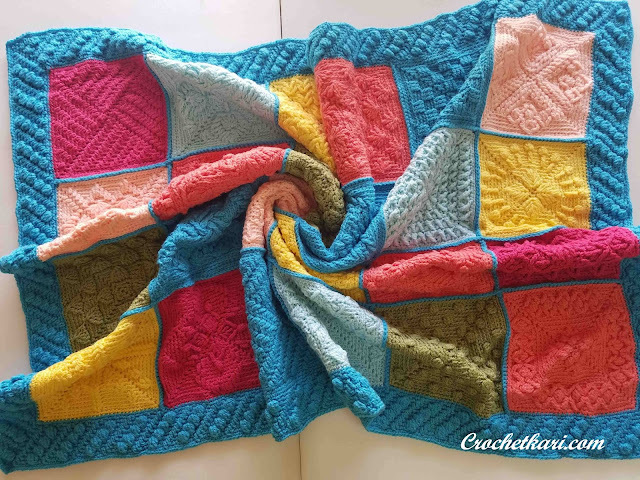 In spite of all that texture going on, on the front, the back of the blanket is really neat making it just right for little ones! Can you tell I am in love with the blanket! While it is all fine to say "Age is just a number", I think nature always catches up. I am now in my early fifties and while making this blanket I got a sudden and real urge to have little grand-babies playing around me. In the meanwhile, my hexagon blanket is still in the WIPs basket waiting for a border and hopefully, I can reach a decision soon. I hope you are following me on Instagram as I share my progress pics and crochet experiments there, before posting on the blog. It is really very pretty. Love the colors and all the different patterns. Nice work! Gorgeous !!!! Colors and patterns !!!!!! The blanket is super gorgeous! It looks more like knit to me. I totally agree with you on standing for National Anthem in cinema halls. I don't think it's an appropriate place to play the Anthem and show your patriotism. That blanket is gorgeous..... very very beautiful Sangita.